Click here to view our Indian Antiques & Primitive Furniture Collection on our new website! India smacks your senses. It gives new meaning to exotic and its furniture has to be seen to be believed. See our galleries here. We are getting better at negotiating our way through the markets of India. Owner Harry is finding pieces that reflect the timelessness, the smells, the textures of India. They speak of tradition, and reveal themselves in the layers of culture that have blended together to create a style that is uniquely India. You connect with Indian furniture on a deeper level. 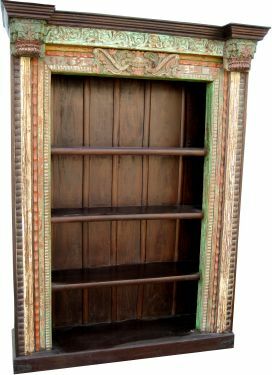 We have a great selection of colonial antiques from India, Indian Almirah, old door cabinets, sideboards, handicrafts, pillars, British Indian teak bookcases and cabinets, Tibari arches, Copper pots, old print making stamps and lighting. We have a few sets of very special antique coffered doors that must have been sourced from old havelis (private mansions) in India. Tell us what you like. Indian Antiques Gallery 35 - COMING SOON! Wholesale customers. We are now in a position to accommodate wholesale orders of Indian antiques. We have the contacts and suppliers in place. Indian Antiques, Indian Furniture, Indian Handicrafts, Primitive Furniture, Vancouver Indian Antiques, Vancouver Indian Furniture, Vancouver Primitive Furniture.